Royal Canin Yorkshire Terrier Puppy is a complete dog feed specially formulated for Yorkshire Terriers puppies up to 10 months old. 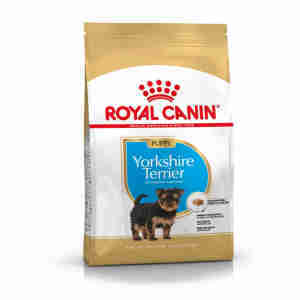 This exclusive formula contributes to maintaining the health of the Yorkshire’s long coat. Enriched with adapted content of Omega 3 fatty acids (EPA & DHA), Omega 6 fatty acids, borage oil and biotin. NATURAL DEFENCES - This formula helps support the Yorkshire puppy’s natural defences. COMPOSITION: dehydrated poultry protein, rice, maize flour, animal fats, vegetable protein isolate*, beet pulp, hydrolysed animal proteins, minerals, soya oil, fish oil, yeasts, fructo-oligo-saccharides, hydrolysed yeast (source of manno-oligo-saccharides), borage oil (0.1%), marigold extract(source of lutein). ADDITIVES (per kg): Nutritional additives: Vitamin A: 29500 IU, Vitamin D3: 800 IU, Biotin: 3.07 mg, E1 (Iron): 49 mg, E2 (Iodine): 4.9 mg, E4 (Copper): 9 mg, E5 (Manganese): 64 mg, E6 (Zinc): 192 mg, E8 (Selenium): 0.11 mg -Technological additives: Pentasodium triphosphate: 3.5 g - Preservatives - Antioxidants. ANALYTICAL CONSTITUENTS: Protein: 29% - Fat content:20% - Crude ash: 7% - Crude fibres: 1.3% - Per kg: Omega 3 fatty acids:7.2 g including EPA & DHA: 3 g - Omega 6 fatty acids: 37.2 g. *L.I.P. : protein selected for its very high assimilation. Hi I'm happy to buy from you! Very good a pets food. My dog very heppy. Thank you for Royal Canin dogg food, your food its perfect!!! When I brought my puppy he had terrible diarrhea, after a couple of days it cleared up, using royal canin yorkshire junior. Highly recommended.